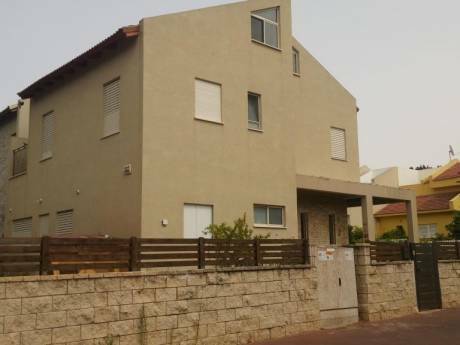 Comfortable duplexe suitable for 5 situated in Moshav in north Sharon area. My three childeren and myself live in a comfortable 5 room duplexe. 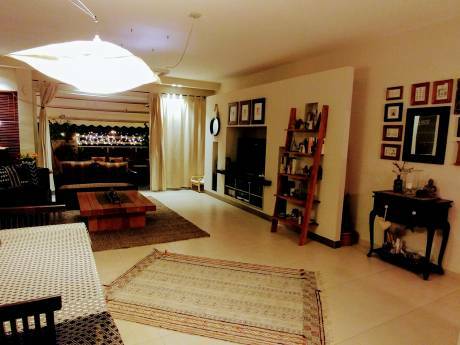 The home is family/childeren/teenage orientated - so warmly furnished but nothing extravagant. The double bedroom is very spacious. There are additional 3 single bedrooms all wth double bed or beds that open to a double. The downstairs living area is light and airy. Our home has all the necessary electrical appliances (washing machine, dryer, dishwasher etc.). The flat is fully airconditioned which is important in the summer. There is a dryer but also an additional balcony upstairs (apart from the downstairs balcony in photo) where you can dry washing. Location wise - we are 20 min drive from sea, 40 min drive from Tel Aviv, 40 min drive from beautiful Carmel Hills. My name is Naomi, 43, clinical psychologist. Am divorced and have 3 great kids - 2 girls aged 11 and 14 and a boy aged 6. I was born and grew up in London until moving to Israel at the age of 9 with my parents and brothers. My mother owns a meshek (agricultural land) on the moshav and her house is situated in a bustan (a variety of fruit trees) and you are welcome to enjoy her hospitality as well as ours. I will be visiting my brother and his family in the U.K. during August (6-26/8). We will mostly be staying with them in the Birmingham area but need a place in London for a few days (around 16-20/8). We welcome you to stay at our home for the full period of time we are away. We live in a moshav which is accomodated by over 400 families - nearly all with young chideren. We are a close community very friendly and warm and there are many joint activities. Some of the families have houses on farmland. We live in a relatively new neighbourhood - low apartments. Across the road is a park, there are fields, woods and orchards within and surrounding the moshav. Also within the moshav is a grocery store, cafe' and many more in the area.